Some LEDs come with a distinct warning for use in enclosed fixtures. Lighting manufacturers discourage consumers from using the bulbs in completely enclosed settings, due to heat dissipating issues. Simply put, in fully enclosed environments, LEDs have a difficult time managing heat, which can cause the temperature to rise inside the housing. Because enclosed designs are tight, heat has nowhere to go, and ends up going back to the bulb. Forcing an LED to function inside an enclosed fixture would greatly lower its lifespan, and cause inconsistent performance (flickering, shifts in color temperature and/or premature failure). It’s important to consider that abnormal conditions directly affect an LED’s ability to produce light. On the other end of the spectrum, if the bulb was exposed to bone-chilling temperatures below its standard operating threshold, it would also display signs of degradation. Additionally, a handful of LEDs are designed to withstand high temperatures in tightly designed housings. The best way to know if an LED light can be used in enclosed environments is by checking the label. Buyers should pay close attention to normal room temperature recommendations, which is not the same as junction temperature settings. When in doubt, purchase LED units that are approved for enclosed fixtures. Alternatively, one could also opt to use lights that rely on older technology, including incandescent and CFL bulbs. The main concern with enclosed fixtures is the lack of vents or holes, which results in stagnant air flow and rapid accumulation of heat. As established earlier in the article, poor heat dissipation and high ambient temperatures can cause lumen depreciation or force an LED bulb to fail prematurely. Heat and LED light performance have an inverse relationship: when the temperature of the luminary’s junction increases, the light output of the lamp decreases. 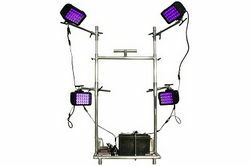 However, the performance of the light can recover, when the LED cools down or is exposed to lower temperatures. Heat from LEDs is typically removed using conduction or convection. With focus on the latter method and considering that trapped air is not efficient in conducting heat, some designs have holes at the top and bottom side of the unit to promote vertical air flow over the light. Sealed environments, including enclosed fixtures, go against such designs, causing heat to build up around the LED. LED junction temperatures are affected by the surrounding temperature of the fixture, the current going through the unit and the efficiency of the heat sinking components in and around the light. To ensure consistent performance at high ambient temperatures, some manufacturers install a compensation circuit in the unit, which adjusts and maintains the current running through the LED. This solution is not always effective, and exposure to high temperatures could still cause overdriving in LEDs with compensation circuits- ultimately shortening its intended lifespan. Interestingly, high temperatures also have negative effects on epoxy resin qualities inside LEDs. Most LEDs are encapsulated in transparent, epoxy resin. At high temperatures, the resins shift and expand from a solid to a rubber-like state. To prevent such occurrences from contributing to the failure of the LED, the junction temperature must be maintained below the maximum temperature threshold of the epoxy resin. When the resin expands and contracts rapidly due to exposure to high temperatures, wire bonds inside the LED become displaced, resulting in untimely degradation of the affected wires.